Open OPTIONS.TXT (Steam) or DATA.TWT (GOG.com). Find the line containing Yon and change the value from 35.00 to 70.00 or more. 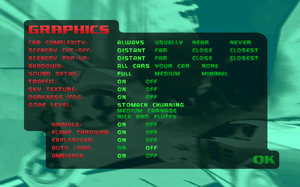 Entering the in-game settings menu will revert the value. Can be forced through graphics driver or dgVoodoo2. 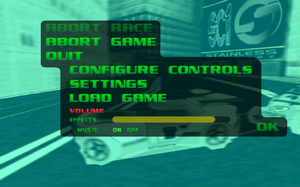 Use dgVoodoo2 with the Direct3D renderer. 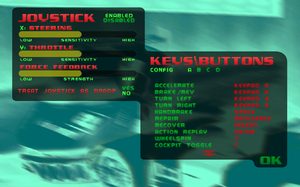 Certain keys are hardcoded in the menu, preventing use of a WASD control scheme for example. Use the Carma Key Binder to work around this. Sliders for X-axis (steering) and Y-axis (throttle). Caused by graphic tablet software. 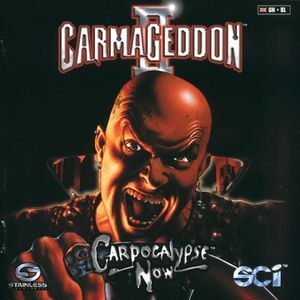 The music does not play in the GOG.com version of Carmageddon II. ↑ 3.0 3.1 File/folder structure within this directory reflects the path(s) listed for Windows and/or Steam game data (use Wine regedit to access Windows registry paths). Games with Steam Cloud support may store data in ~/.steam/steam/userdata/<user-id>/282030/ in addition to or instead of this directory. The app ID (282030) may differ in some cases. Treat backslashes as forward slashes. See the glossary page for details.